ጉዳያችን Gudayachn: አቶ አንዳርጋቸው ፅጌ በየመን፣ሰንዓ ከተጠለፉ በመጪው ማክሰኞ ሰኔ 16 አንድ ዓመት ይሞላቸዋል። who is Ato Andargachew Tsige? አቶ አንዳርጋቸው ማን ናቸው? አቶ አንዳርጋቸው ፅጌ በየመን፣ሰንዓ ከተጠለፉ በመጪው ማክሰኞ ሰኔ 16 አንድ ዓመት ይሞላቸዋል። who is Ato Andargachew Tsige? አቶ አንዳርጋቸው ማን ናቸው? Andargachew Tsege was born in Addis Ababa, Ethiopia on 9th of February 1955. He is one of nine children. He grew up in a household where it was a sanctuary to the down and out! His mother who was a teacher by profession had great empathy for people in need and was always helping. This is where we can say Andargachew’s life-long commitment to fight for the underdogs began! His love for Ethiopia was greatly influenced by the stories his great grandmother use to recount to him when he was a young boy. His grandmother who was born towards the end of Theodros’s reign and lived through Menelik’s and later Haileselassie’s reign had lots to tell to the impressionable young boy. During his high school years in Teferi Mekonnen High School and later as an engineering student at Haile Selassie I University, he became very active in the student movement. Following the Ethiopian revolution of 1974 when a military dictatorship (Derg) seized power he joined the Ethiopian People’s Revolutionary Party (EPRP) and went underground like most of the Ethiopian youth in their struggle against the Marxist regime. During the Derg’s Red Terror campaign of 1974, his younger brother Amha Tsege was murdered by the security forces. In 1979 he immigrated to the UK as a political refuge. He studied Philosophy at what is now known as University of Greenwich doing his dissertation on the German philosopher Immanuel Kant in the early 1980s. When Derg fell in 1991, he went back to Ethiopia to help the newly formed government of Meles Zenawi. Within two years, he was disillusioned with the whole ethnic based politics and left the government. He moved back to London and started writing articles that were critical of the regime and its divisive politics. In 2005, he went back to Ethiopia to publish his bestseller book in Amharic which loosely translates to “Freedom fighter who does not know freedom” an analysis of the current state of Ethiopian politics. Soon, with an invitation from then leader of Rainbow party Berhanu Nega, he went back to help the party in the ill-fated election of May 2005. In June 2005, he was imprisoned and tortured during the crackdown by the government of Meles Zenawi after the election. After his release, he came back to London where he was able to campaign against the regime by testifying at different government or international organization including the US congress and EU Human Rights committee as well as think tanks like Chatham house. He became the principal spokesperson for the CUD party in exile and was instrumental in mobilizing the global Ethiopian diaspora for a worldwide campaign to secure the release of the CUD leaders and all prisoners of conscience. In May 2008, he founded Ginbot 7 Movement for Justice, Freedom and Democracy with Berhanu Nega one of the exiled leaders of CUD. He was elected as Secretary General of Ginbot 7. He has inspired many especially the young by his selfless devotion and commitment to bring about change in Ethiopia. Andargachew lived with his partner his 7 year old twins and 14 years old daughter in London. In June 23, 2014 in the most extraordinary circumstances, he was once again imprisoned by Ethiopian regime. 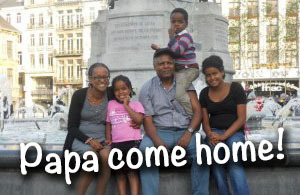 While in transit in Yemen Sana’a airport, he was abducted and taken back to Ethiopia.